I’m always a little sad to see the end of May, my favorite month, but this year it was a hectic one, and I’m looking forward to June. 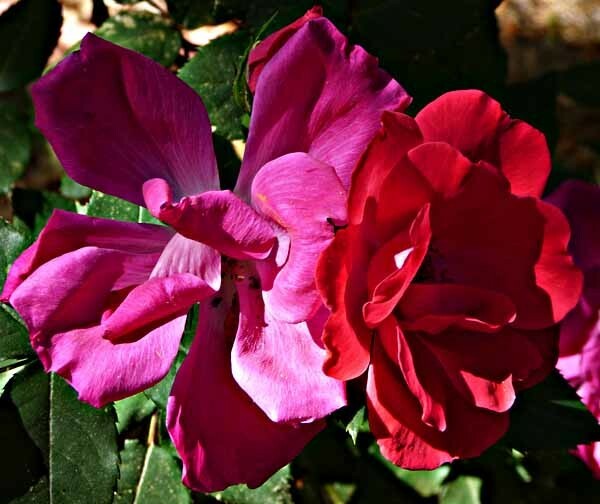 More flowers are blooming in the yard, these Roses are doing quite well. 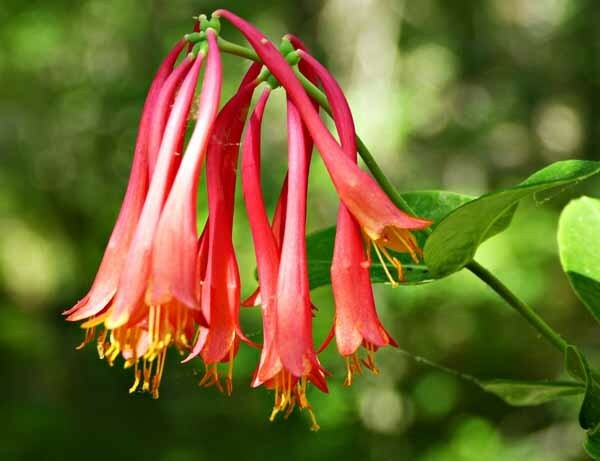 The Trumpet Honeysuckle is elderly and nearly dead, but still putting out a few clusters of blossoms that the hummingbirds love. 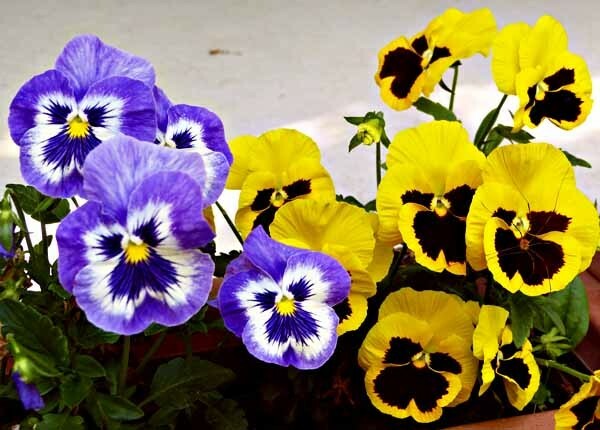 These pansies were the first annuals I planted, at the end of April, and they’re still looking good. When it gets hot they’ll probably need to be replaced. 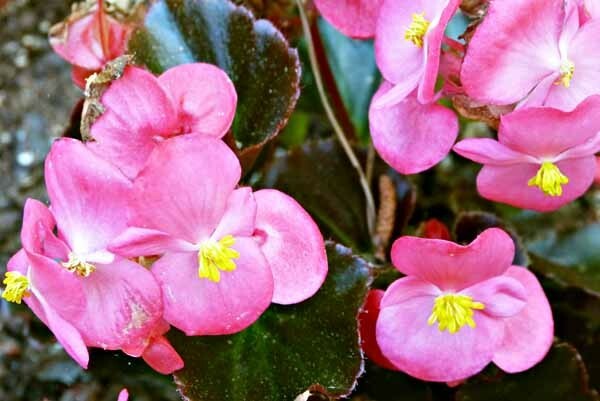 All the annuals I put in last weekend are doing well, like these pink Begonias. Of course, I have to water them, we’ve had very little rain for the last two months. …and Tigger on our bed upstairs. We relaxed, too. I finished a book I’ve been enjoying all week, played my guitar a little, and rocked on the porch, where Ellen was doing some scrap-booking after a small watercolor. A good day, lovely weather, and on we go to June! This entry was posted in Cats, Nature on May 31, 2015 by Todd. 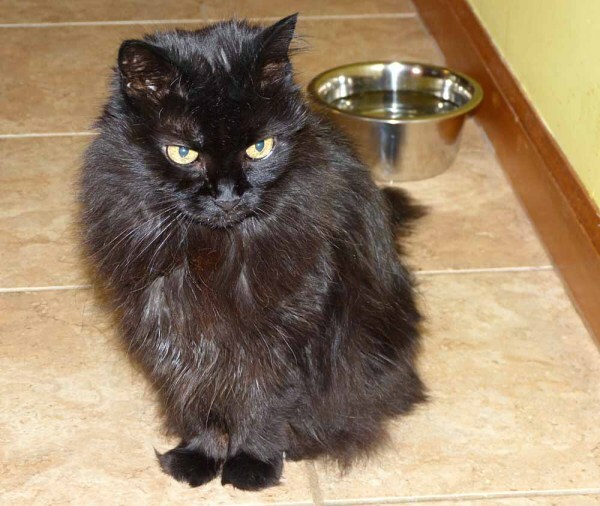 Our older cat Katie has gone to her final rest. She was a rescue, abandoned at a kennel where we used to board our other cats. We had her a little over 17 years, but she was full grown when she came, so must have been at least 18. Katie was not an easy cat to love. Grouchy and feisty, she never sat on laps. She liked to be petted JUST on the top of her head, and when she decided. Any other time and place you might get nipped. 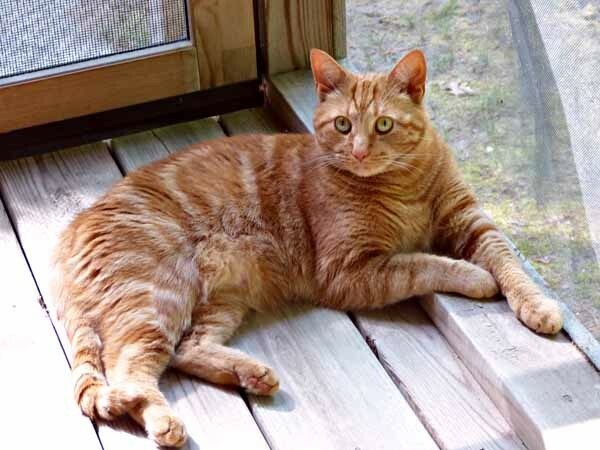 When we brought our orange tabby brothers Tigger and Leo into the house five years ago, Katy would have none of them, and until about a month ago, when she got too weak, would hiss and swipe at them if they got too close. Katy had been in decline for a few years. This past year, Ellen gradually went to greater and greater lengths to keep her going, including hand feeding and fluids, but finally she was too weak to walk much, and had trouble breathing, so it was time. Our lives will get a little easier now, but we will miss her. This entry was posted in Cats on December 11, 2014 by Todd. Every once in a while a photo taken on a momentary whim really works. I think this one does. 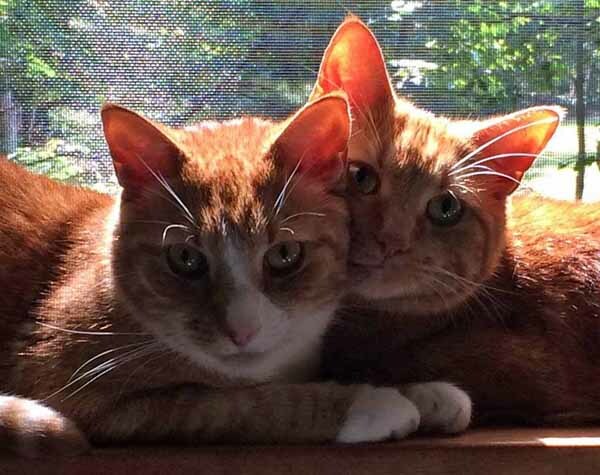 Tigger and Leo sunbathing on my windowsill this morning. As of now, my favorite picture of them. This entry was posted in Cats on July 7, 2014 by Todd. 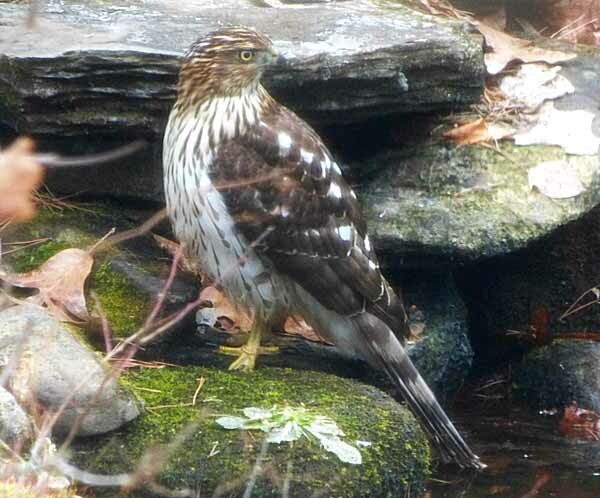 We’ve had a rough winter in New Jersey, with well over 20 storms passing through since December. Here at the southern end of the state we’ve escaped the worst of the ice and snow, but today’s storm got us, dropping about six inches. 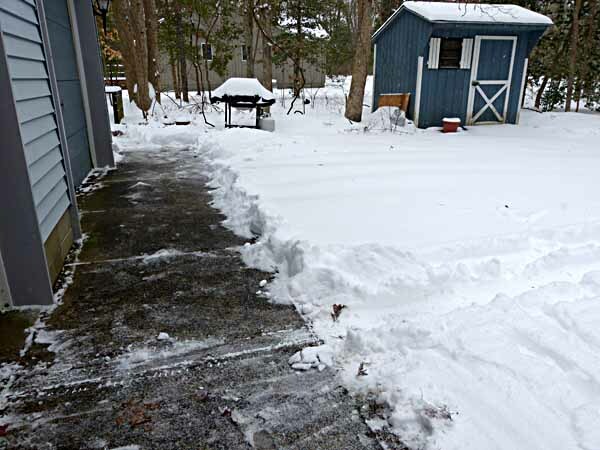 I shoveled the front walk, the driveway was still passable without shoveling, as Ellen proved with her car. Good thing, I shouldn’t be shoveling the driveway, bad for my back. After our snow work we went for a walk in the woods behind our house. I don’t go there most of the year because there are plenty of ticks, but in winter that’s one thing we don’t have to worry about. 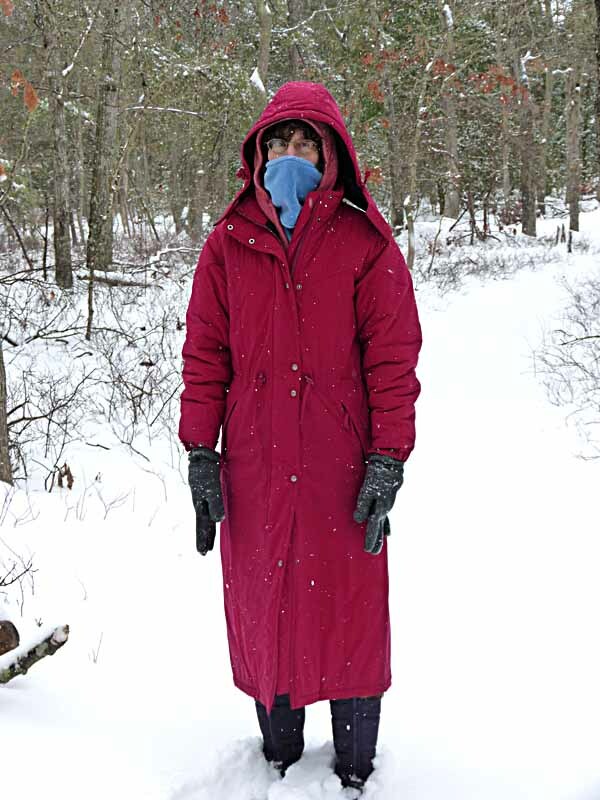 Ellen is well bundled. We had rain last night before the snow, and the changeover left a thin coating on the trees, like this American Holly, which grows throughout the woods in our area. 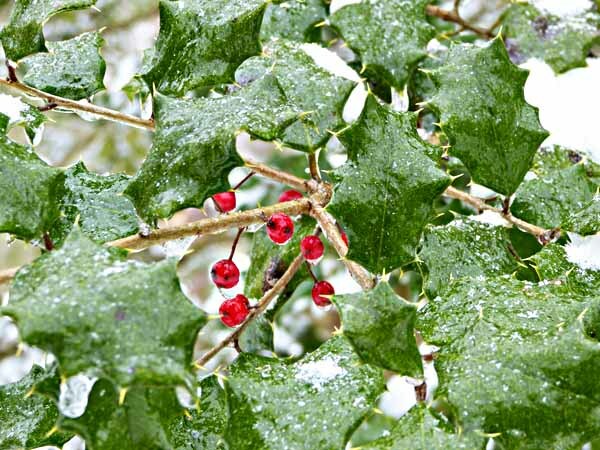 The Robins that winter here get by on the berries when the ground is covered or frozen and they can’t dig for worms. 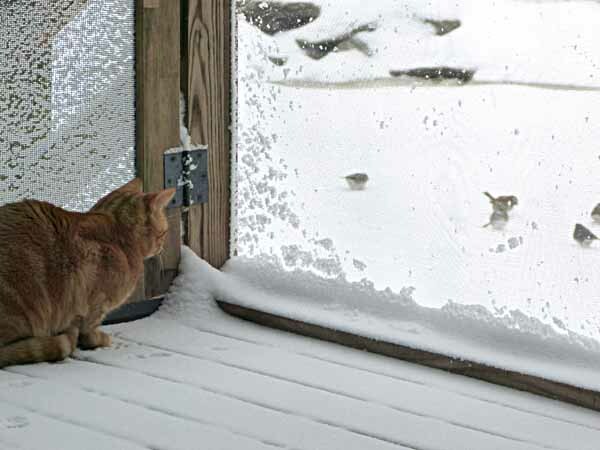 No matter the weather, our boys Tigger and Leo want to go out on the screened porch to watch the birds and squirrels at our feeders, but this snow thing on the porch floor is an unexpected hazard. Tigger didn’t stay out long. Leo lasted longer, dancing from one pair of feet to the other, with lots of shaking and licking the cold toes. He did enjoy watching the birds, but before long he was at the door wanting to come back in. We stayed in the rest of the day, too. 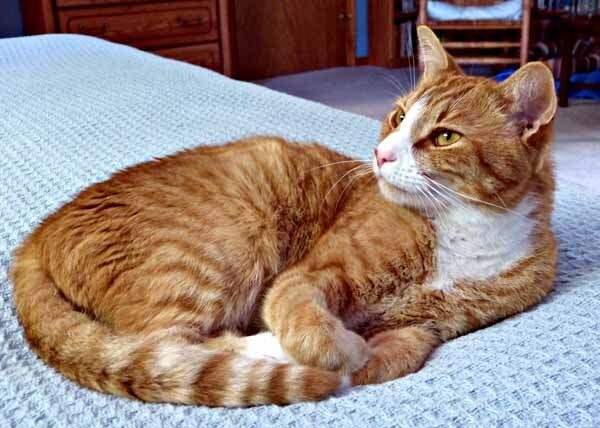 This entry was posted in Cats, Nature on March 3, 2014 by Todd. 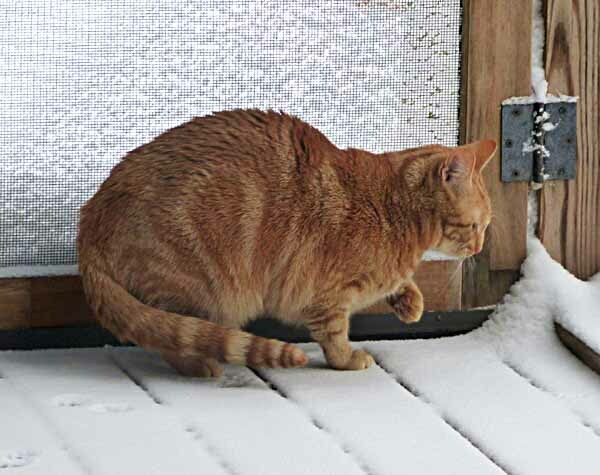 This entry was posted in Cats, Nature on January 3, 2014 by Todd.